The quartz countertop is Fresh Concrete from Caesarstone. Denham chose a matte finish for a softer look. The slate floor tiles came in three different finishes for a random effect. Three designers share their tricks for transforming the most private space in the house. ‘I love the simple form of the tub and the modern, simple tub filler,’ says designer Katie Denham. 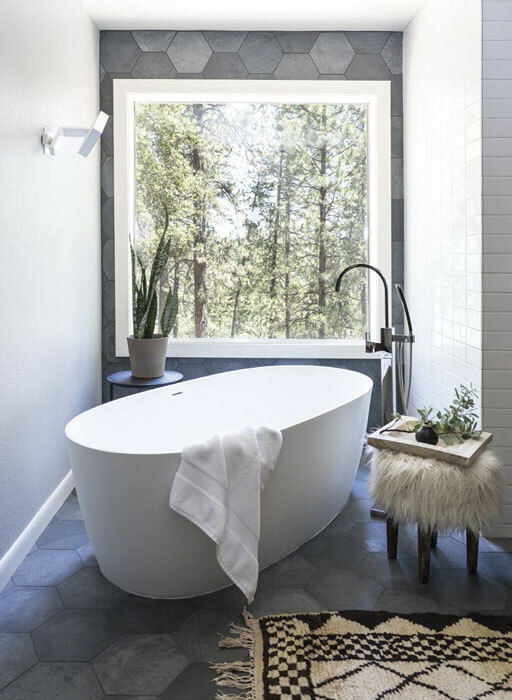 As the room’s jumping-off point, Denham chose large-format hexagonal slate tiles for the floor and the wall behind the tub. For a touch of drama, she angled the tub in front of a big picture window that provides a stunning view of the trees outside. Kids usually get the short end of the stick when it comes to family design decisions. Not the young twins who share this hall bathroom in Loomis. Working with interior designer Samantha Crow of Juxtaposed Interiors, their mom opted for a high-end farmhouse look. “The house is on horse property, and they have horses,” explains Crow. 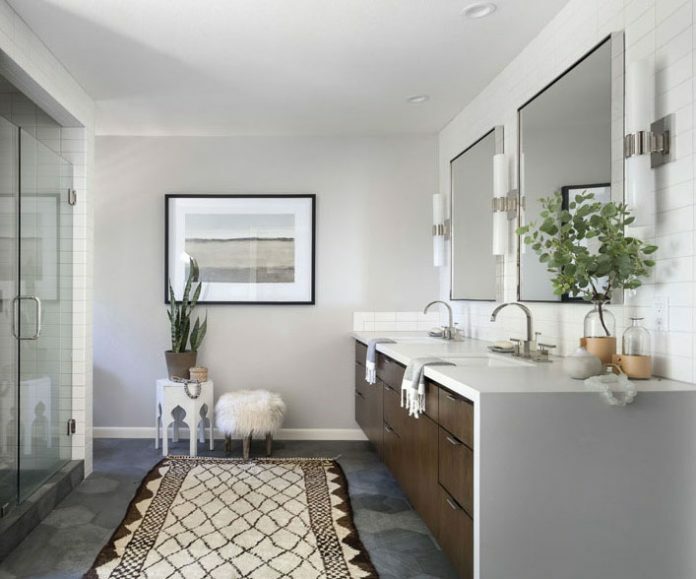 For the shower walls, she opted for porcelain tile that looks like aged barn wood. (Wardlow Tile & Stone installed the heavy tile—typically used as flooring.) The dual vanity has a hand-rubbed black finish and a sink for each child. On the wall hang handsome black-and-white photographic horse portraits. “It’s not a childish bathroom at all,” says Crow. “The house is on horse property, and they have horses,” explains Crow. 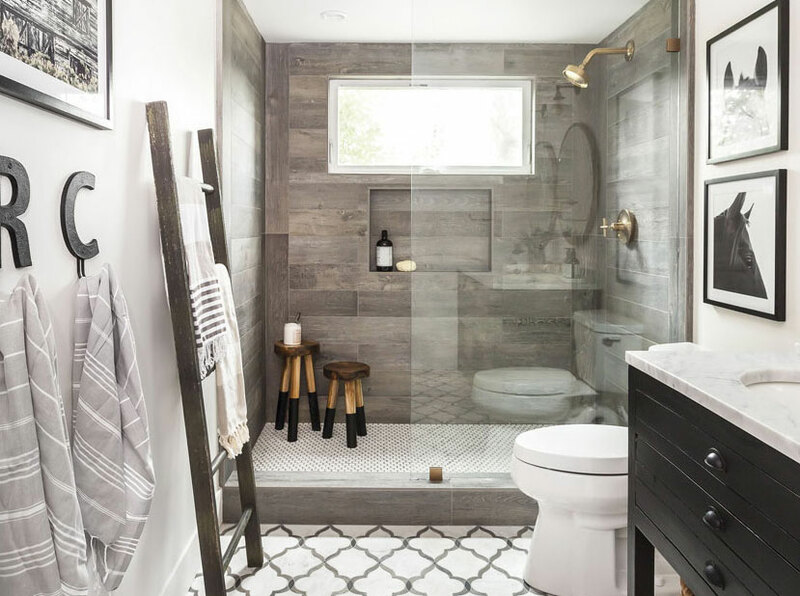 For the shower walls, she opted for porcelain tile that looks like aged barn wood. (Wardlow Tile & Stone installed the heavy tile—typically used as flooring.) The dual vanity has a hand-rubbed black finish and a sink for each child. On the wall hang handsome black-and-white photographic horse portraits. Feminine is the word for this master bath in Clarksburg. The homeowner, a single woman, wanted to transform a dated ’80s bathroom into a luxurious retreat using classic materials and top-of-the-line fixtures. Feminine is the word for this master bath in Clarksburg. 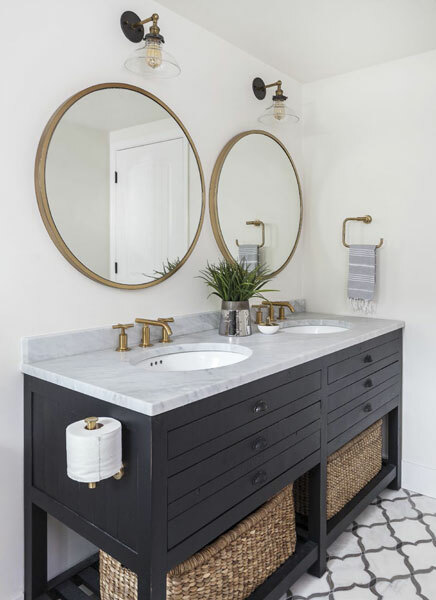 The homeowner, a single woman, wanted to transform a dated ’80s bathroom into a luxurious retreat using classic materials and top-of-the-line fixtures. For assistance, she turned to interior designer Rebecca Ward. “She wanted Carrara marble and white cabinets,” says Ward. 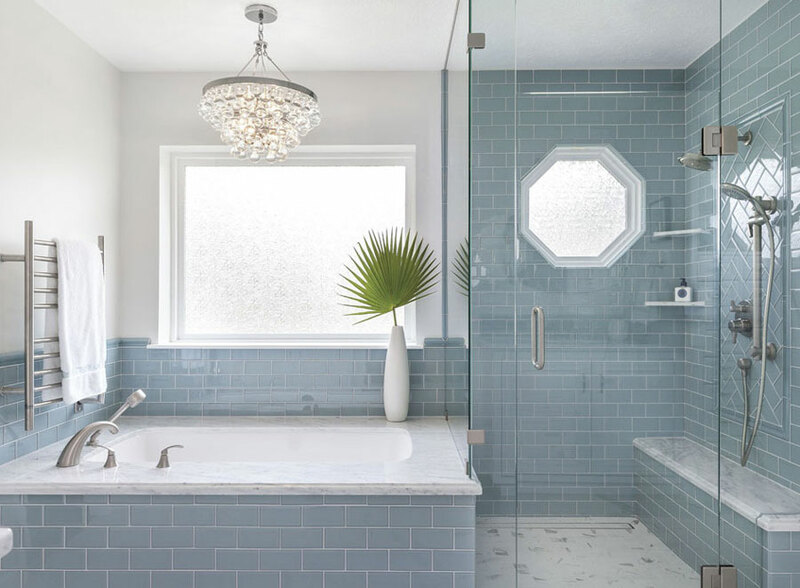 “Nothing too modern—just soft curves.” Ward brought in boat-shaped mirrors that mimic the shape of the sinks and used watery-blue glass subway tile for the shower and backsplash to give the room a serene, spalike air. 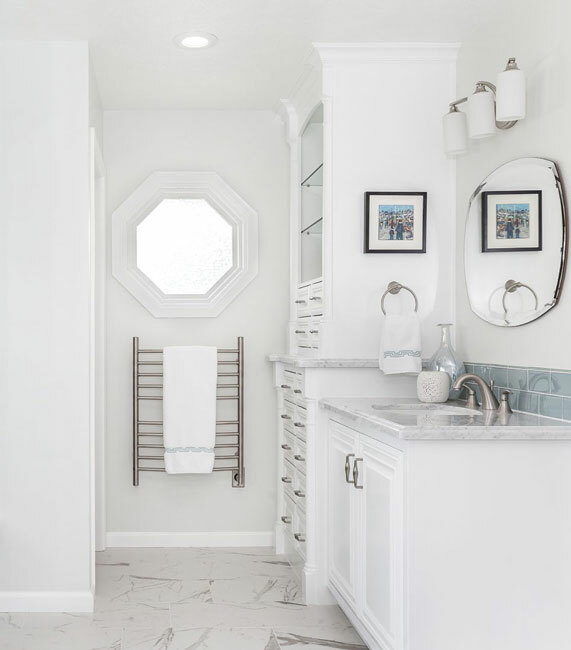 Ward brought in boat-shaped mirrors that mimic the shape of the sinks and used watery-blue glass subway tile for the shower and backsplash to give the room a serene, spalike air.